We often provide music at special business events. VIP Receptions, Grand Openings, Benefit Sales. It’s a long list, and we entertain at all of them. We’ve learned how to help clients and shoppers enjoy being there. Same as at a wedding or a party. Just a different celebration, in a different setting, that’s all. 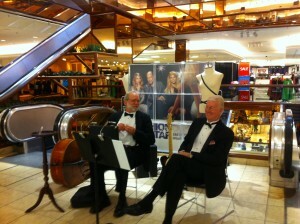 Here we are last Saturday, between songs at Macy’s Stanford Shopping Center. The store is featuring the latest fashions in one of their most popular dress lines. We’re in the center of the women’s department, entertaining shoppers as they check out the bargains. Selecting music for this event is a piece of cake. For the store manager and for us. The manager tells us about the atmosphere she wants, and we know the right songs to create the mood. We set up two chairs and tune up. Right away people approach us with requests. “Can you play “Fly Me to the Moon”? “I love Jobim. Can you play one of his songs”? Often they like “Stardust”, or “Unforgettable”, or “As Time Goes By”, or “The Way You Look Tonight”. And so a few hours fly by. Shoppers are smiling, humming, looking over the special fashions, and chatting with us. Business is good, and the manager is delighted. Working with us is so easy. Before we leave, she asks us about two more special events they’re planning for later this spring. Now, about you, whether you’re planning a wedding ceremony, a cocktail party, a business banquet, or a store opening. With all the other party details you’ll be preparing, what could be easier than this tip? Here’s a tip for planning the music. Describe the mood you’d like us to create, and if you like, tell us a few of your favorite songs we’ll be sure to include. Event planning is comes with skill to manage the all small thing to create a successful event. I want to peruse my career as event manager when I am going through your post I start thinking that how important to make relation with your mates and learned from them. I like the post and keep posting such blogs on events.